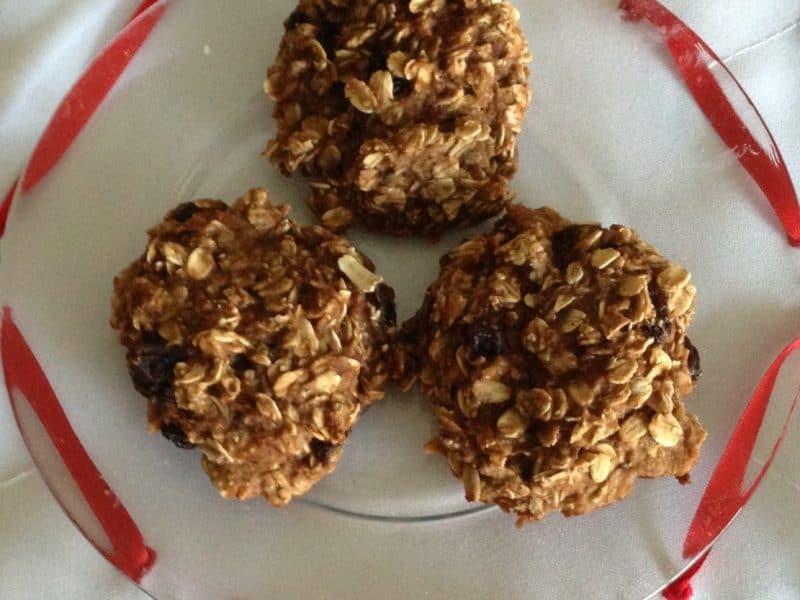 These cookies are “simply sweet” because they contain no added sugar. Their slight sweetness comes entirely from the bananas, raisins and almond milk. 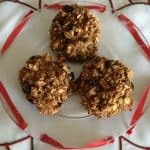 They are perfect for so many occasions: a light, healthy breakfast, a mid-morning or mid-afternoon snack, a post-workout pick-me-up, or a good option for kids with the after-school munchies. As-is, they are vegan, as they contain no eggs, butter or animal milk. If you would like to make this recipe gluten-free as well, simply use gluten-free oats, such as Bob’s Red Mill Gluten Free Rolled Oats . If it suits your fancy, dress up baked and cooled cookies with a thin layer of peanut butter and a drizzle of melted chocolate for an extra treat! Mash bananas with a potato masher. Add applesauce, vanilla almond milk, vanilla and cinnamon; mix well. Use a 1/3 cup measure to scoop batter onto baking sheet. These cookies will not spread during baking, so you can flatten them if you prefer a thinner cookie, or just leave them mounded. Bake at 350 for 17-20 minutes. Let cool on sheet for 1 minute, then remove to wire rack to cool completely. Store in an airtight container.